As much as I love airy opulent dining rooms, there’s something about a small mom-and-pop shop that brings comfort. A feeling that soon I’ll be nourished with something hearty and I’m really supporting someone (not a massive corporation) in the process. Hence, when South China Noodles Delight came on the radar, a two-person team in a 20-seat restaurant, I bee lined there as soon as it opened and found it mercifully had no line. Despite furnishing the place with the narrowest tables I’ve ever seen (construction workers may mistake the thing for a work bench), the dishes are substantial – for a table of three we ordered two large bowls with a side of boiled vegetables ($4) and it was enough to satisfy. Small versions are available for $2 less. 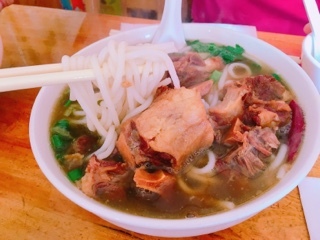 The ox tail vermicelli in soup ($13) is the perfect combination of bites of tender beef augmented with bits of sticky chewy tendon. 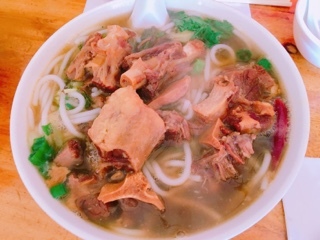 It arrives steaming and with all the bones and cartilage, the soup base was certainly hearty – a bit salty on its own, but goes wonderfully with the neutral noodles. 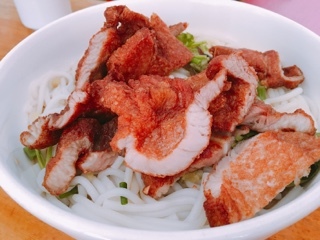 Without a doubt, the pork chop ($9) vermicelli is a great deal: incorporating at least two large lightly dusted deep fried pork chops, made fresh to order. 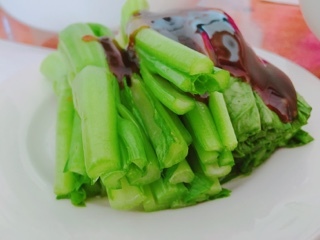 For this, we tried the dry option, which still uses a layer of soy sauce broth at the bottom but is then also topped with pickled preserved vegetables. For me, it’s a little bland, but with a couple of drops of fragrant chili oil became tastier. As a warning, the restaurant is small, so leave the strollers outside, refrain from wearing a huge jacket (it’ll reek like food anyways), and there’s nowhere to hang a purse so bringing a compact bag is key. Nonetheless, South China Noodles Delight makes a great bowl of noodles. Not to the point that it would warrant travelling great distances for – after all, the entire meal lasts under an hour. But, if you’re hungry and in the mood for some hearty “home-cooking”, bring an appetite and your craving will be sedated.